Michigan DeLorme Atlas: Road Maps, Topography and More! 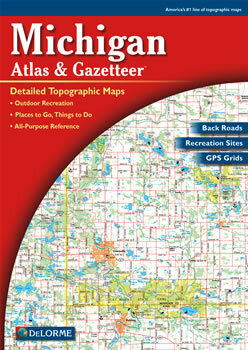 Get the entire state of Michigan in 102 large pages of up-to-date maps in this DeLorme Atlas and Gazetteer! These maps have an index of the state's place names for easy look-up. The back cover of this atlas has a large map of Michigan with an overlying grid. Each cell of the grid contains the page number for a detailed map of that area. Many physical features, such as rivers, creeks, lakes, wetlands, hills and forests are included on the detailed maps. Also shown are the man-made features which include: towns, cities, roads, highways, railroads, airports, dams, orchards, parks and game lands. This atlas has 18 additional pages of reference information on the state's recreation and attractions. The information includes: Michigan's parks, wilderness areas, gardens, beaches, waterfalls, golf courses, wineries, museums, campgrounds, hiking, skiing and biking. There are so many details and extras you will not be disappointed with the DeLorme Atlas and Gazetteer!